Elnaz Nourabadi is a student at the University of Tennessee – Chattanooga and is an ISA Featured Photo Blogger. She is studying abroad with ISA in Bangkok, Thailand. Buddhism in Thailand is an ever-present force that can be discovered by anyone who is willing to let it into their conscious perception. Given that it is the official religion of Thailand, Theravada Buddhism is practiced by 95% of the population. This is seen throughout the country by many different mediums. On a smaller scale, San Jao Thi, or spirit houses, are erected around almost every Buddhist household, community, campus, and even outside stores and by trees. Community members offer flowers, fruits, red liquids, and animal figures to these spirit houses to bring good luck. Although this Buddhist idea of making merit is mixed with superstitious folklore ideals of sacrifice, the spiritual image and positive protective energy that these vibrant, ornate buildings create always bring a smile to my face. Other acts of merit are also dispersed around the nation: hanging symbolic ornaments around a rear-view mirror, putting little Buddha statues around the house and car, offering food to monks, and burning incense to bring good luck and request divine favors. A San Jao Thi on the corner of a hidden street. 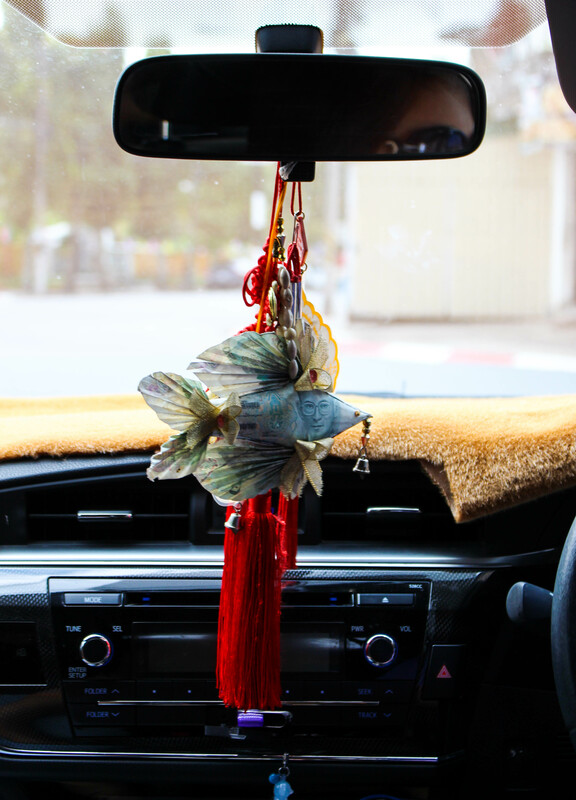 A fish ornament made of money hanging in the front of a taxi driver’s car. Fish are a symbol of prosperity and fertility. 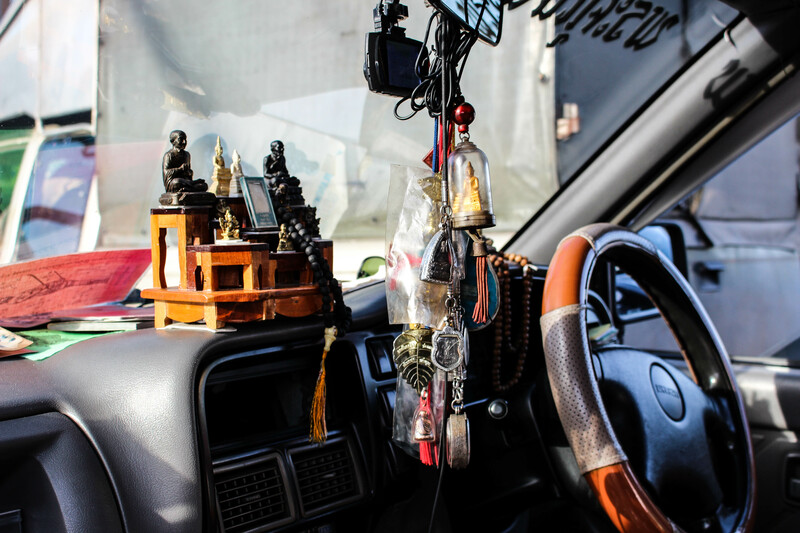 A collection of little Buddhas and amulets on the dashboard of a songthaew, or a truck taxi, used to protect the driver and his customers. 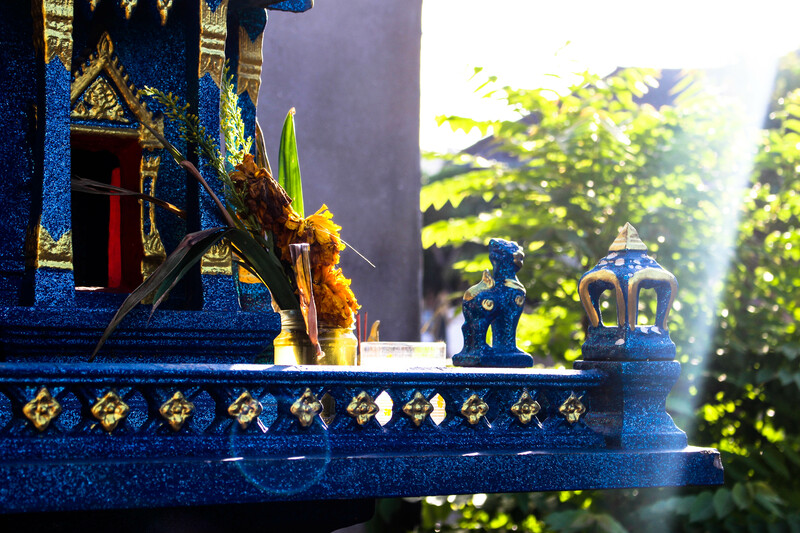 Along with incense and flowers, candles are placed in front of Buddhist temples and statues as a mark of respect. The flame represents the light of the Buddha’s teachings. 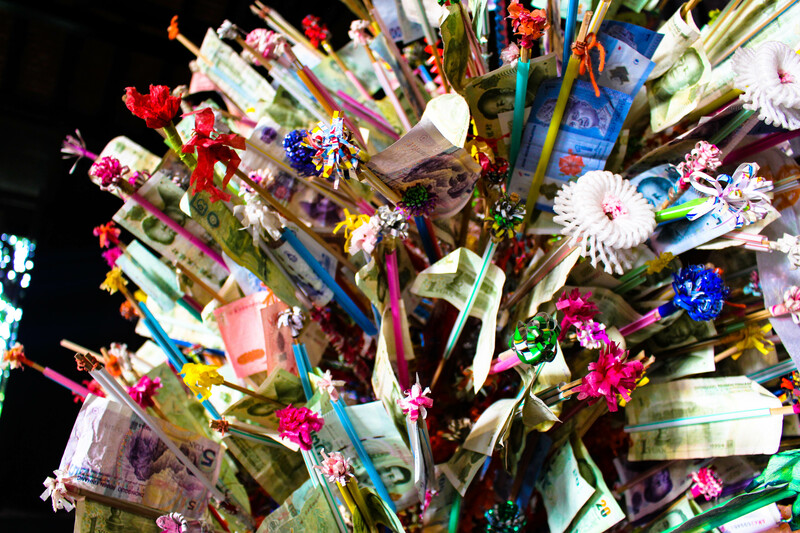 A money tree at a temple in Chiang Rai. Money trees are a great way to make merit and donate to a cause. They are set up by communities for specific purposes, such as repairing a temple. While they are “growing”, people donate money to add to the tree. Once the tree is full, the money goes towards the cause. On a larger scale, Buddhism is present in the towering temples scattered all across the country. There are 40,717 Buddhist temples in Thailand. This is due to the major role that temples play in Thai society and culture. People go to temples to pray to Buddha, asking for good health, wealth, and fortune. One can seek advice from the monks that reside at the temples and from Buddha himself. Temples also act as an educational center and a community center. 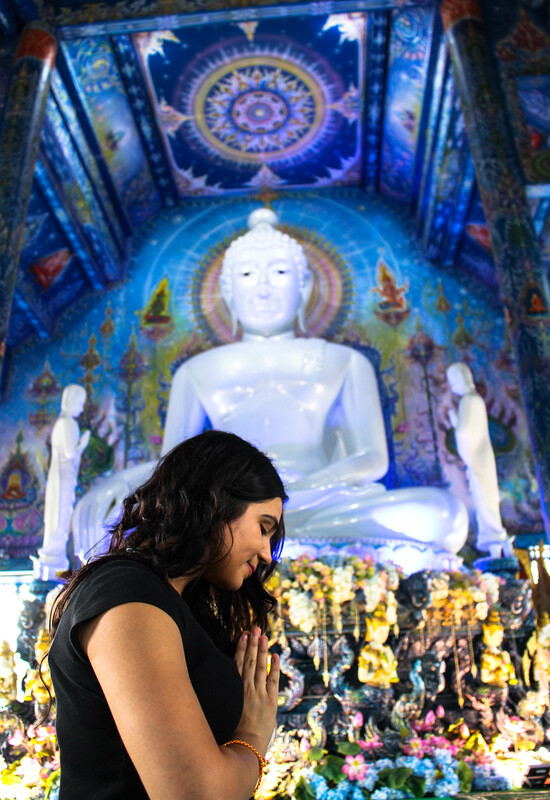 Parents bring their kids to temples and tourists visit temples to learn about the history of Buddhism and how the temple they are at influences and is vital to its community. Community members gather at temples for special occasions and to perform Buddhist rituals. Temples also act as places of healing. For physical, emotional, and mental well-being, temples provide an oasis to bring nurturing and aid to those in need. 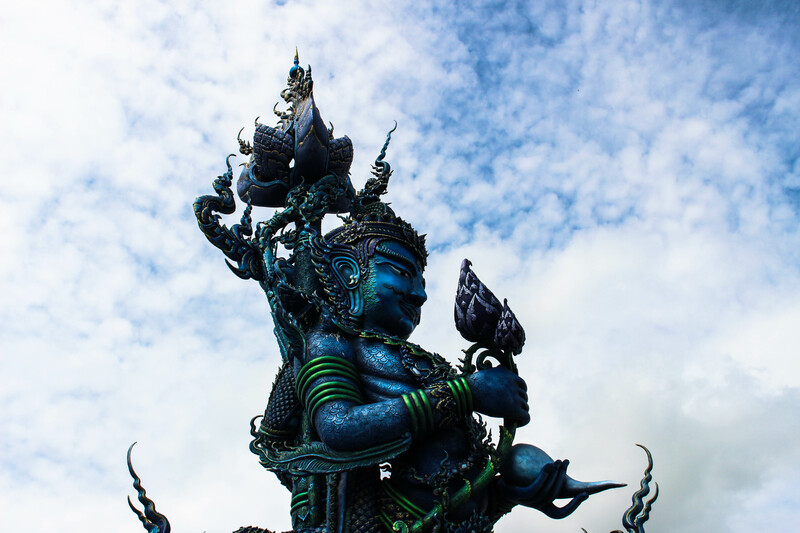 The Blue Temple, or Wat Rong Seua Ten, in Chiang Rai, Thailand. 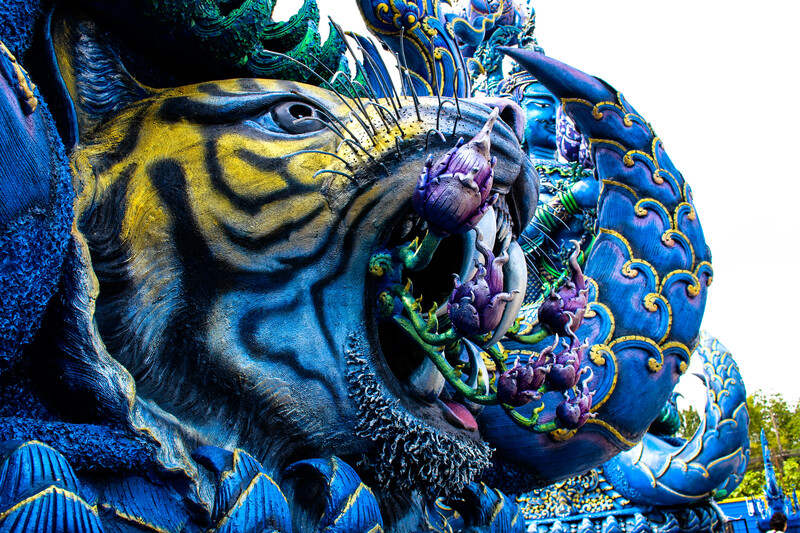 “Seua Ten” means dancing tiger, named after tigers who used to jump over the Kok river that runs through Chiang Rai. 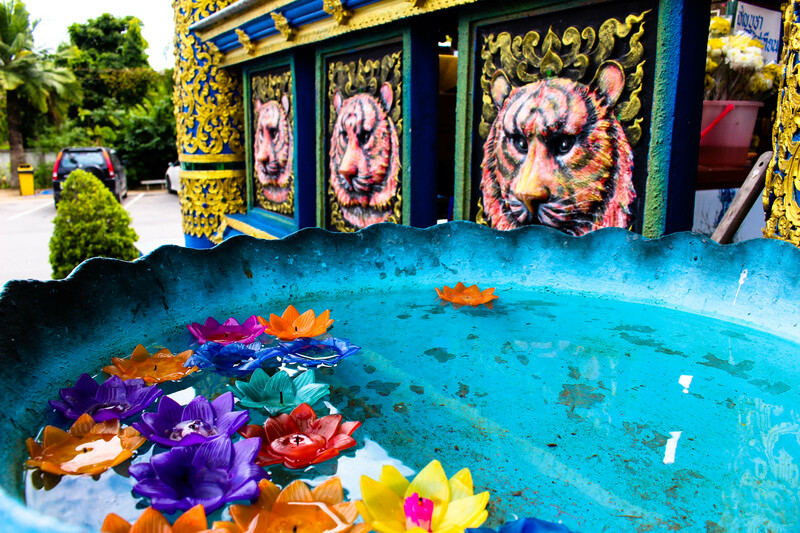 Located at the entrance of the Blue Temple sits a vibrant and ornate tiger statue, part of a larger, more intricate set of statues that act as a gate into the temple. A guardian statue at the entrance of the Blue Temple, another part of the statues that line the entrance. Words are unable to describe how magical and beautiful it was inside of the Blue Temple. My roommate Marissa offering the wai in front of Buddha. The wai is a form of Thai greeting performed to show respect. It is used to show a greeting or goodbye, a thank you, an apology, as well as praying to Buddha and acknowledging monks. The White Temple, or Wat Rong Khun, in Chiang Mai. This temple is an unconventional, modern, privately-owned art exhibit and temple. Created as a replacement for the original Wat Rong Khun, the owner, Chalermchai Kositpipat, designed this to display the cycle of rebirth. Photos are not allowed inside the temple, but the intricacies and beauty of the structure are visible even from outside its walls. It is for these reasons I feel such a strong spiritual and emotional energy in temples. Although sometimes more popular and populated temples may seem geared towards tourists and consumerism, the age-old purpose of the temple soars past any new age ideas of marketing religion and engulfs visitors with a sense of spiritual cleansing and revival. The accumulated energies of over 300 years of prayer, learning, and working towards a goal of releasing suffering and reaching enlightenment find a way to crawl deep into the structures of these already beautiful, intricate temples and enter the minds and souls of any visitor who is open and willing to experience it. Sometimes it is hard to find, but out of the multitude of temples I have visited, I have only not been able to experience this cathartic energy at one. Even if you are not Buddhist and do not understand or agree with Buddhist beliefs, I encourage anyone who has the chance to visit a Buddhist temple to simply be open and try to understand the magnitude of what these buildings represent, not only with your brain but also with your heart.